HARARE (AP)—An unbeaten century by Tillakaratne Dilshan guided Sri Lanka to a crushing nine-wicket victory over Zimbabwe on Wednesday in the final of the limited overs tri-nation series at Harare Sports Club. Dilshan, who looked in control from the start, scored 108 off 102 balls as he steered Sri Lanka to a total of 203-1 in reply to Zimbabwe’s 199 all out. The Sri Lanka captain was pleased to get back in the runs, with the four-nation Asia Cup coming up later this month. Dilshan’s seventh one-day international century featured 14 boundaries and helped build an opening stand with Upul Tharanga of 160 as they punished some loose bowling from the home side. Tharanga added 72 before Graeme Cremer eventually removed him from the crease after a needless run out in the 26th over. Tharanga’s half century came off 79 balls and he had smashed eight boundaries before the run out. At that point, Sri Lanka’s victory was inevitable and the Zimbabweans’ body language showed they had conceded the defeat against a side they beat by eight wickets in the final round-robin match. Dilshan finished off the chase together with Dinesh Chandimal, who ended the match unbeaten on 16 as they reached the total wth 15 overs to spare. Earlier, Sri Lanka’s bowlers had dismissed Zimbabwe in 49 overs. Seam bowler Dilhara Fernando caused most of the damage, finishing with figures of 3-36 in his nine overs, while Jeevan Mendis took 2-36. Zimbabwe captain Elton Chigumbura said: “The Sri Lankans bowled well and never allowed us to get away. I thought we just did not apply ourselves. 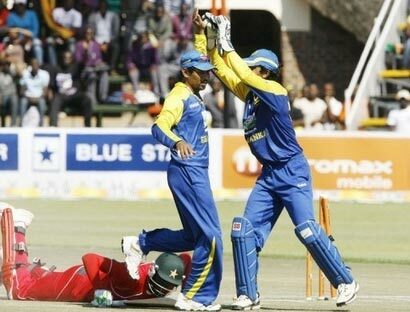 Zimbabwe wicketkeeper-batsman Tatenda Taibu provided resistance in the middle order, chipping in with 71 from 93 balls before being dismissed by an excellent one-handed diving catch by Chamara Kapugedara off Fernando in the 36th over. Greg Lamb had the second best score of 37, but the rest of the home side’s batting order failed to find runs on a track that offered some turn. “I am really happy with our all-round performance and I am also happy for the young players, especially Chandimal and Jeevan,” said Dilshan.